Food containing high amounts of added salthas long been associated with health problems. Diets high in salt can increase the risk for cardiovascular disease, high blood pressure, heart attacks, and stroke. A new study indicates it may also increase the pace of aging. A group of scientists recently tested how overweight and obese teenage boys responded to a high-salt diet. The overweight/obese teens were divided into a low-sodium group where they were given 5 g of sodium per day and a high-sodium group that received twice that amount. They noticed that a high-salt diet accelerated the aging process in the overweight and obese teens by shortening cells tied very closely to aging. These changes at the cellular level occurred in the telomeres, which serve as protective caps at the end of a person’s chromosomes. The shorter they are, typically, the older they are. Think of telomeres like the plastic tips found at the ends of shoelaces responsible for protecting them from fraying. If you lose those tips, the shoelaces can get ruined. The same thing happens with your cells. Each time a cell divides the telomeres get shorter, and once they get too short, cells stop dividing. This process has also been associated with age-related conditions like dementia, heart disease, type 2 diabetes, and some cancers. These are also conditions associated with being overweight or obese, but the research indicated that shortened telomeres work in unison with obesity, with increased salt intake working to shorten them at an even faster pace. Although the study looked at heavy teenaged boys who were in the 14-18 agecohort, this is important news for anybody struggling with their weight. After all, if it’s causing cellular aging in teenagers, it’s possible the degradation might be even further advanced in older people. It appears that cutting sodium intake can slow down the cellular aging process, thus limiting excessive weight gain and the risk for dementia, diabetes, high blood pressure, heart disease or a potentially fatal heart attack or stroke. The average American consumes about 3.5 g per day, with many consuming far more. The recommended daily intake is 1.5 g. The problem is that most people aren’t aware of where all the salt is coming from. In fact, the average American consumes 2 g more than the recommended daily level—proof that sodium can really sneak up on you. Processed foods are the main culprits. Meats, soups, and other foods that come in a package or can are usually very high in sodium. But it doesn’t stop there.Breads and cereals are packed full of it, too. This can be quite surprising for many and can shock people who believe they eat a low-sodium diet. After all, salt is virtually impossible to taste in bread in cereal. In contrast, these products usually taste rather sweet. To limit salt in your diet, try to increase the amount of fresh foods you eat. Purchase raw meat to cook, fresh fruits and veggies while doing your best to stay away from frozen, pre-cooked and processed items. When it comes to bread and cereal, read the labels. If you like to add salt for flavor, consider substituting it with other spices. A great low-sodium cereal substitute is oatmeal. I personally like to have a cup of oatmeal mixed withtwo tablespoons of almond butter, 100 g of blueberries and some sweetener and cinnamon sprinkled on top to get me going most mornings. It’s nutritious, delicious, and heart-healthy! Knapton, S., “Salt Makes Overweight People Age Faster,” Daily Telegraph web site, March 21, 2014; http://www.telegraph.co.uk/science/science-news/10712648/Salt-makes-overweight-people-age-faster.html, last accessed March 26, 2014. “Americans Consume Too Much Salt,” CDC web site, February 24, 2011; http://www.cdc.gov/features/dssodium/, last accessed March 26, 2014. 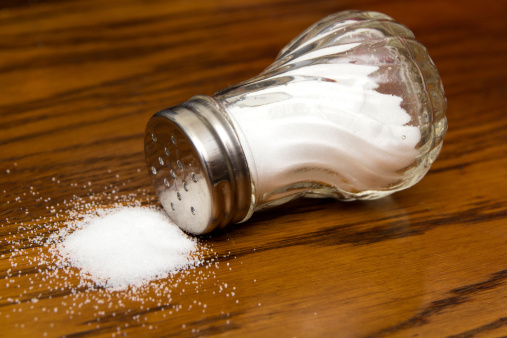 “Sodium and Salt,” American Heart Association web site, 2014; https://www.heart.org/HEARTORG/GettingHealthy/NutritionCenter/HealthyEating/Sodium-Salt_UCM_303290_Article.jsp, last accessed March 26, 2014.